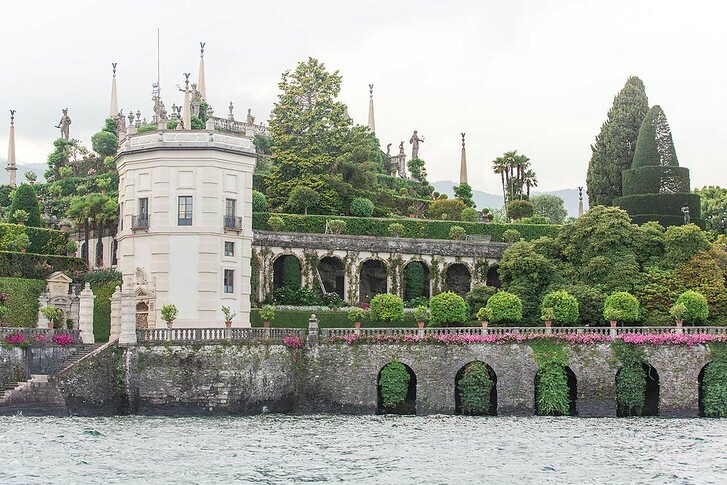 The Borromean Islands are a trio of islands in Northern Italy that have been owned by the wealthy Borromeo family since the 1600s. Over many generations, they turned these three islands into fantastical retreats with beautiful villas and landscaped gardens. 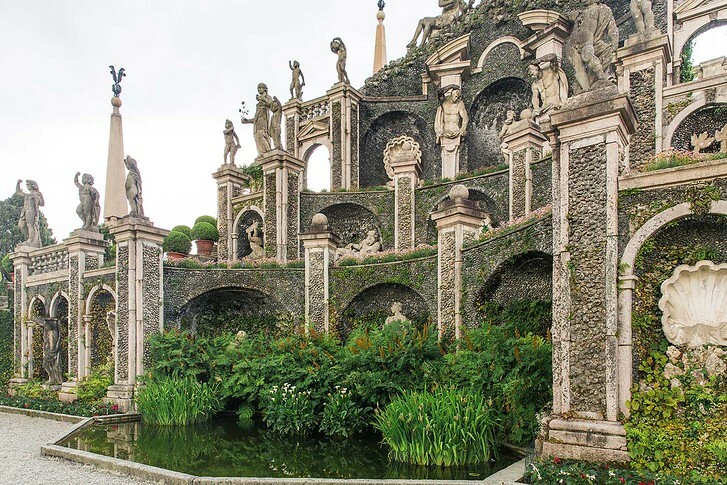 If you’re headed to Lake Maggiore, you absolutely shouldn’t miss visiting Isola Bella and the Borromean Islands. Keep reading for some travel tips from our visit, including how to get there, when to go and what to see! 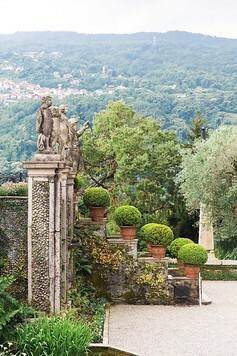 Isola Bella has a beautiful villa and terraced garden while Isola Madre has its own villa and an English style garden. Isola Superior is the smallest of the three and nicknamed Isola Pescatori, or Fisherman’s Island. This one is a great place to have dinner, as there are a couple of family run restaurants serving fresh fish and great local-style Italian cuisine. To get to the Borromean Islands from Milan, it’s easiest by car. However, you can also take public transportation. First take the train from Milan’s Centrale Station to Stresa. The ride is roughly 1 hour. Check the Italy train schedule and buy tickets online here. In Italy, train fares increase with time, so book your tickets once you know your travel dates. 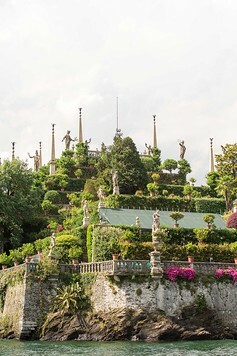 Once you arrive in Stresa, walk to the boat dock (roughly a 10-15 minute walk) and find the next boat to Isola Bella. Public and private boats link all the islands to the Lake Maggiore towns of Stresa and Baveno. There are roughly 2 boats per hour during high season from April to September. Private boats will take you directly but cost a little more. Ticket prices depend on the destination but are roughly 6 to 12 euros round trip if you’re just visiting ONE sight (Isola Madre, Isola Bella, Villa Taranto etc). You can buy the ticket online here if you just want to visit Isola Bella. If you plan to see all of the sights, a more economical and convenient ticket to get is the circulation ticket that allows you to take multiple stops between your departure and arrival ports. You can buy this online in advance here or on the dock. If you’re short on time, you can day trip from Milan to Lake Maggiore and quickly tour Isola Bella. But, I would really recommend staying overnight and basing yourself in Stresa or Baveno to properly explore Lake Maggiore. 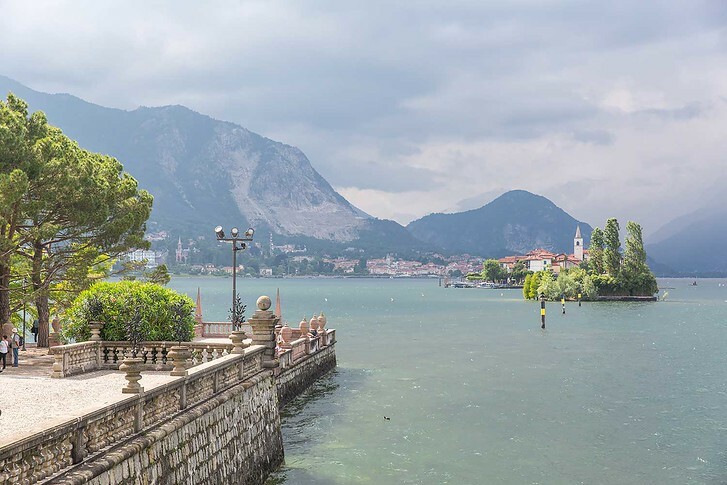 The area has a romantic feel, if slightly dated, and I found the fresh lake air and cool temperatures of Lake Maggiore to be quite a refreshing change from Milan! Baveno is slightly smaller than Stresa and more quaint, with the same grand Victorian hotels that were popular during Italy’s Romantic Age. We stayed in Baveno for 2 nights at the Grand Hotel Dino. The property was really lovely, although slightly dated in the way all Maggiore hotels are. Our corner room had a cute balcony overlooking Lake Maggiore and the hotel backyard led right to the boat dock! If you stay here, I highly recommend the on-site restaurant Last Hall. It was designed by Paolo Maldotti and serves tasty modern Piedmont cuisine. There are also a couple of swimming pools and ivy covered walkways – it’s really a huge property. The aristocratic Borromeo family were rich merchants and bankers who originally hailed from Milan. The family produced many cardinals and Archbishops of Milan during the Catholic Reformation and were politically important members of the Duchy of Milan. 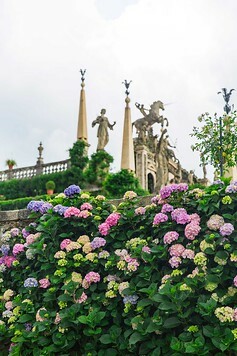 The family still own the islands today and when they’re in town, their family flag is flown from the top of the Isola Bella garden. Isola Bella is the largest island and was built by the family as their summer palace. Charles Borromeo (who also sponsored the Duomo of Milan) named the island for his wife Isabella. 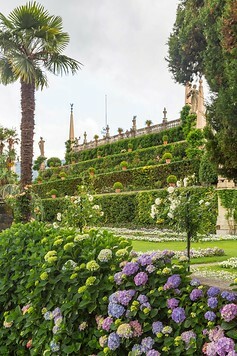 It took many years for the villa and gardens to be built but when they were completed, Isola Bella was host to Europe’s royalty, including Napoleon and Josephine and the Princess of Wales. A fun local legend is that Caroline, the Princess of Wales, wanted to buy the neighboring island Isola Madre from the Borromean family but they refused to sell it to her. 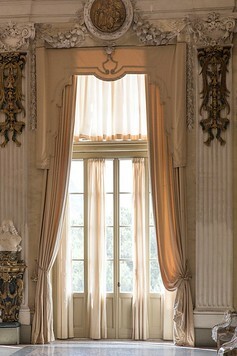 Instead, she chose an island on Lake Como and acquired Villa d’Este – the most famous villa of that Italian lake! 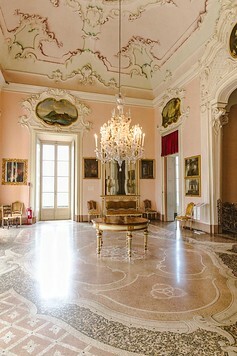 The Baroque style palace on Isola Bella is lavishly decorated. 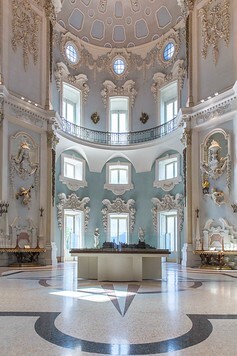 When you enter, you’ll find a dramatic staircase with the crests of Italy’s top families, an art gallery from the Borromeo family’s private collection and even a throne room! Before Italy was unified, the Dukes of Milan were like royalty and the Borromeos were quite the aristocrats. 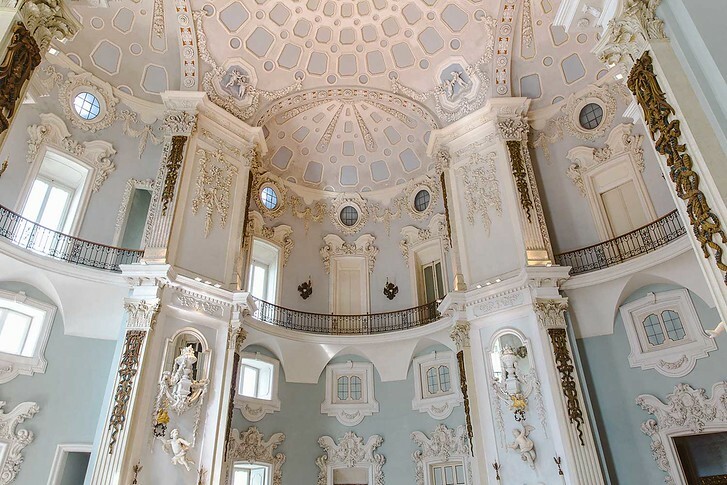 Next is the dramatic music room, decorated in blue and white, where history was once made. In 1935, Mussolini met with British and French diplomats to sign the Stresa Front, a treaty unifying the three countries against Germany in an attempt to prevent World War II. 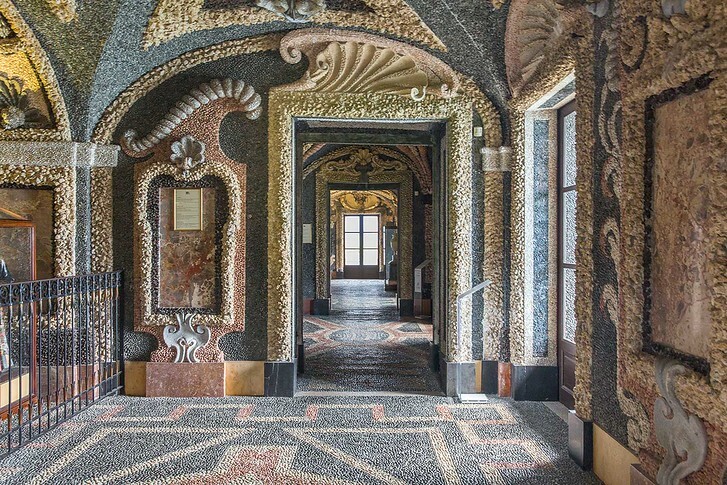 Obviously, that didn’t pan out..
As you continue on the tour, you’ll find a grotto, decorated in black and white stones with shell patterns. It felt almost like a basement and I found out later through our guide that the rooms were meant to be cooling from the heat of Italy’s hot summers. You’ll also find creepy dolls which is part of the famous Borromeo marionette collection and more statues and art. 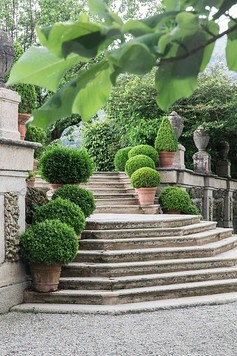 The villa exit leads out directly to the famous terraced gardens. 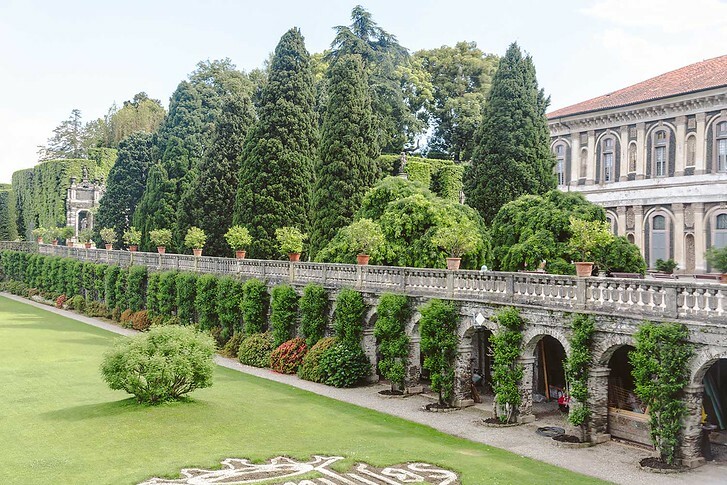 The Baroque architectural style calls for controlling nature so it comes as no surprise that the garden is meticulously landscaped – first through two curving staircases, then to expertly trimmed hedges until you arrive at the masterpiece: the terraced gardens. 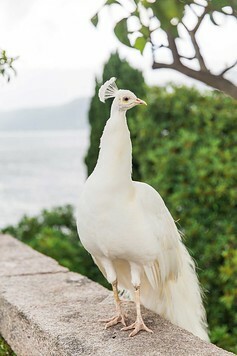 Even more impressive are the white peacocks which roam the grounds and will spread their feathers when they get too annoyed by tourists. To see the palace and garden, tickets are 15 euros. Alternatively, you can purchase a combo ticket for Isola Bella and Isola Madre for 20.50 euros. Audio guides are an additional 3 euros if you want the full history. 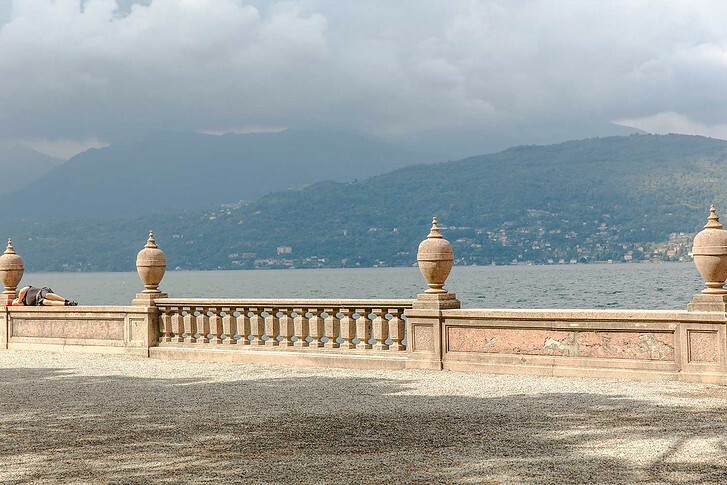 Lake Maggiore and the Borromean Islands are open in high season and closed from late October to late March. 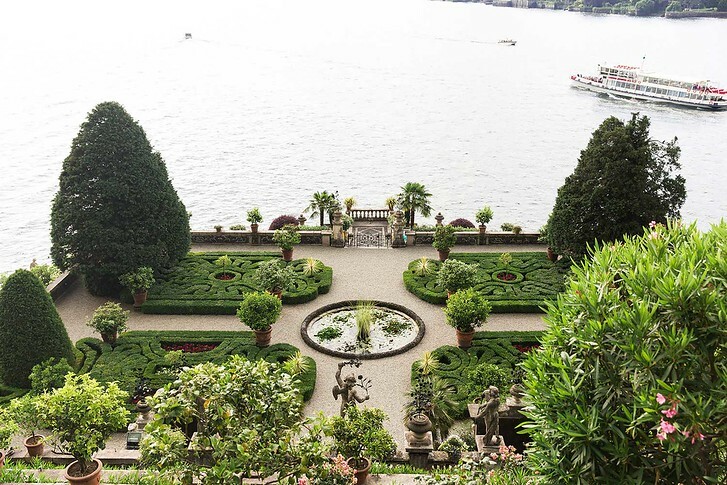 Do you plan to visit Isola Bella and the Borromean Islands? Check out all our articles on the Italian Lakes below! You’re definitely not wrong – it is beautiful! I envy the people who live in these places, great pics, can’t imagine seeing this forehand.. I visited the Borromean Islands after being told about it by the receptionist at our hotel, and boy I was glad I did! Isola Bella is just stunning, and I couldn’t believe I had not heard about it before.